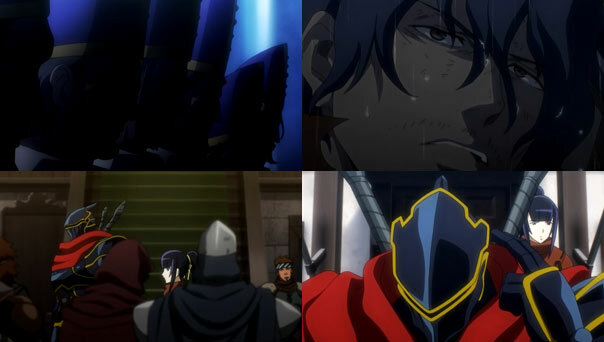 The Lizardmen are allowed to bask in their victory over an army of the undead for an evening, while back at Nazarick the Great One Ains Ooal Gown is debriefing Cocytus before his other guardians. Momonga got what he wanted: Cocytus forms an original thought—that he doesn’t want to exterminate the Lizardmen. 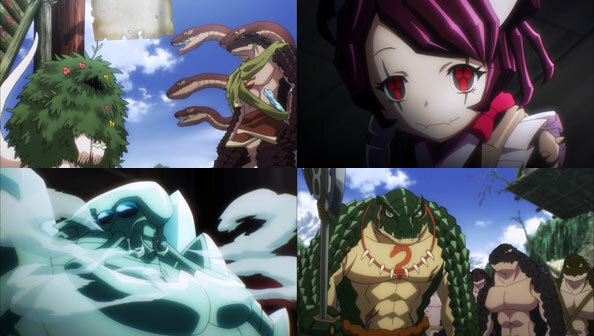 But when he can’t come up with a good reason to spare them, Demiurge comes through with an alternative plan: they’ll make the Lizardmen an experiment in rule without fear. 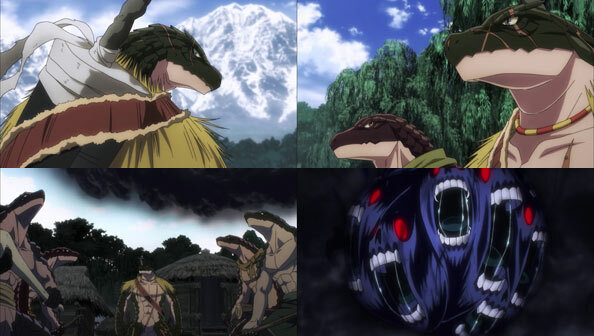 Everything is going according to Ains’ plans, and his guardians think that’s only natural, but privately, Momonga is excited at the prospect of his guardians learning independent thought and gaining experience through defeat…not that he likes defeat. That much is clear the next day when he shows up with an enormous magically-armored undead army, catching the still celebratory Lizardmen unawares. 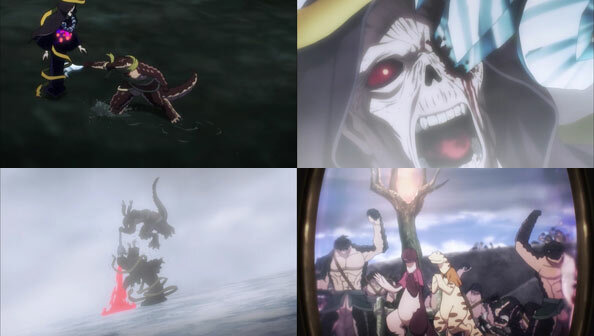 Ains himself shows up, and makes quite an entrance, freezing an entire lake, using Gargantua to throw a huge cube of rock into the middle of it, then having his grunts form an undead staircase. Ains climbs to the top of the rock with his retinue of guardians, proud as you please, and when Zaryusu and his brother meet them in the lake, Demiurge has them prostrate themselves. Zaryusu knows he and his people are at the mercy of Ains and his forces, and that they don’t have a hope of victory against such power. However, he also presumes the Great One does not intend to utterly exterminate his people, but wants a proper battle to make things interesting. If that requires a few sacrificial lambs, with him among them, Zaryusu can live with that, even if it distresses the woman he loves. He asks that she put up with his selfishness this once and hold out hope he’ll come back from the battle in one piece. She seems willing to go along with this…IF he impregnates her first. Love: it’s all about give-and-take. In order to build great things, one must construct a solid foundation. The first two episodes accomplished that. At first, I wondered why all of a sudden we were so immersed in the lives and politics of a bunch of Lizardmen. 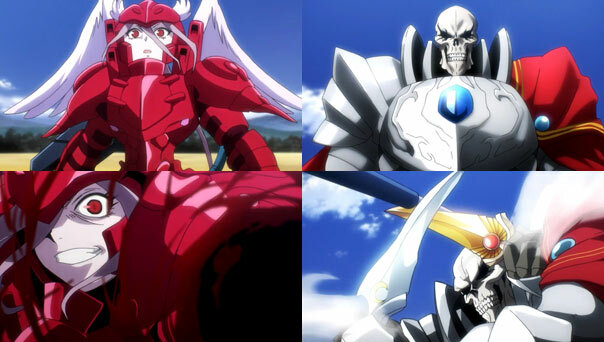 Then, when I got to know a few of them, I became emotionally invested in their fate, even rooting for their victory against the armies of Cocytus, even though Cocytus is a servant of our ostensible protagonist, Momonga. What was made clear this week is that not only was it well worth all the table-setting, which I enjoyed far more than I ‘endured’; but that Momonga and his court were given heightened mystique by being pushed into the background, such that every time we cut to them (which wasn’t often, or for a very long duration), it felt like an occasion. Things start out small, with Zaryusu earning Zenberu’s trust and an alliance after fighting him one-on-one. Crusch heals both, and after returning to Zaryusu’s brother Green Claw, the five assembled tribal leaders have a strategy meeting. The enemy outnumbers them over three to one. Zenberu is confident every lizard can take out three zombies or skeletons each, but they have to plan carefully to avoid being routed. Zaryusu forms an elite squad with Crusch, Zenberu, and his trusty hydra Rororo, to face the enemy commander when they show themselves. Cocytus orders his army to advance, and Ains Ooal Gown seems slightly disappointed that things aren’t going the way he hoped, and that’s all we see of him. From here on in, it’s all battle, which means it’s all payoff for the careful preparation of the previous two episodes. The Lizardmen send out their forces to meet the undead army, while their magical units efficiently keep the foes at bay. Cocytus confides in Demiurge for advice on how to proceed (that is, how to salvage what is starting to resemble a defeat on the field); Demiurge muses that their great lord meant to give Cocytus a weak army and a wide berth in hopes it would promote his awareness. Cocytus is ready to take his medicine, but first sees how his reserves will fare, led by the Elder Lich Iguva, who launches huge fireballs in Zaryusu’s direction, helpfully revealing to the elite unit the position of the enemy leader. Zaryusu decides upon a direct frontal assault, using Rororo’s bulk to shield himself, Crusch, and Zenberu. Once close enough, Zenberu starts carving up the reserves while Zaryusu faces off against Iguva, who is a formidable opponent from any range. It’s too bad none of the Lizardmen had Holy magic! For a moment, Iguva has Zaryusu caught trapped in a Scare spell, but Crusch comes through in the clutch and breaks him out with Lion Heart, in addition to healing Zaryusu’s wounds. Good to see Crusch can hold her own on the battlefield, and indeed plays a vital role keeping Zaryusu up and running. Iguva is full of hubris until the end, when he wrongfully assumes Zaryusu foolishly unleashed the full power of his Icy Burst against him (as a lich he’s immune to ice). However, the ice was only meant to provide cover for Zaryusu’s attack from above, stabbing Iguva through the eye. After a struggle, Iguva is vanquished, and the Lizardmen are victorious, in what was a hard-hitting, heart-pounding, perfectly-paced battle. From his base, Cocytus congratulates the Lizardmen; it was a very close victory, but a win’s a win. 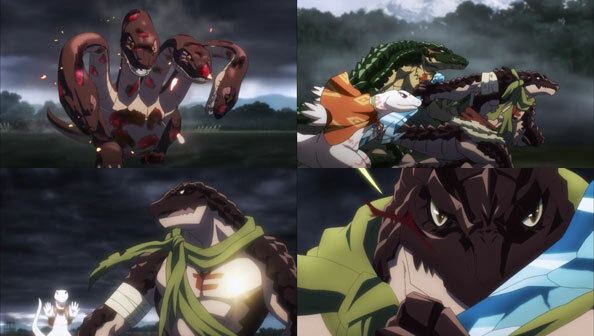 Not only that, the battle forced the Lizardmen to give up their tribal squabbles, come together, and sacrifice for the sake of their race’s survival. 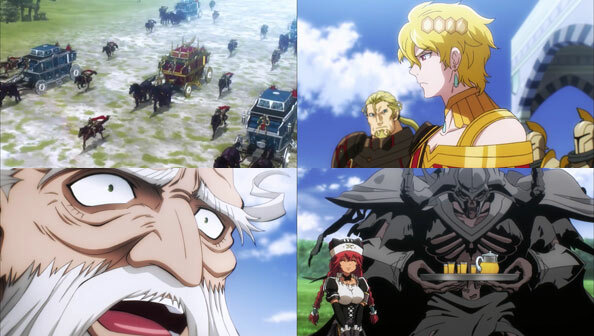 I would think they would continue in peace the unity that was forged by the threat of annihilation, while Zaryusu and Crusch, having come out of the battle in one piece, are poised to marry. Overall, this episode was as satisfying, complete victory; a sure-handed execution of an intricately-constructed, multi-layered story in which the lines of heroes and villains are blurred. I’m eager to see what Lord Ains has planned next—and for whom. 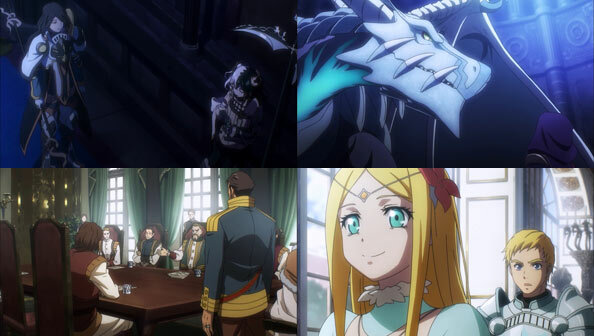 Overlord II takes a deep dive into the tribal Lizardmen (and women) corner of Yggdrasil, this week, and in doing so demonstrates that even with non-human characters, the show excels at straightforward yet immersive world-building. The Green Claw tribe has been given eight days to prepare a “desperate and futile defense” against certain doom, and considering fourth-tier magic was used to deliver the message, the tribe’s head priestess fears the worst. Zaryusu Shasha, while a traveler and no longer a member of any tribe, is nevertheless sent by his brother and tribal chief to speak with the other four tribes about forming an alliance against their mutual enemy, believing that enemy is depending on their remaining disunited. 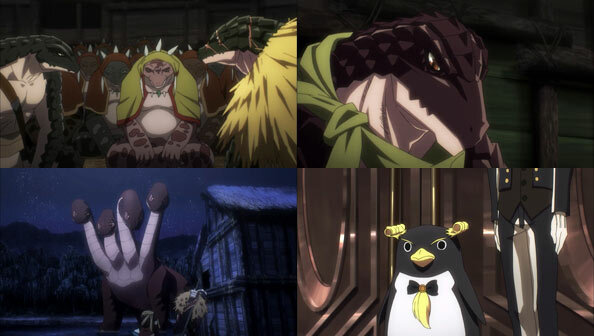 We get a cursory look into the Tomb of Nazarick where the confident penguin Assistant Butler Eclair enthusiastically prepares for the day he’ll rule Nazarick—by keeping it thoroughly and obsessively clean. Zaryusu rides his trusty giant hydra to the lands of the Red Eye Tribe, where he is shocked to find their acting chief and head priestess, Crusch Lulu, is an albino lizard. He is immediately smitten with her, which catches her off guard, but they are able to find common cause with relative ease. I feel like we spend a great deal of time in that hut with Zaryusu and Crusch, but it also feels like time well spent, as we’re able to learn a great deal about the conditions that led to her leadership. In a dire food shortage the former chief resorted to cannibalism, which Crusch and the tribe endured for a time, but eventually there was an insurrection, and she was their leader. Her description of the trials she and her people have endured are vivid and well-told, and Zaryusu, while initially a bit forward, treats her with the respect she’s due. I was legitimately please to hear she’s all for an alliance. 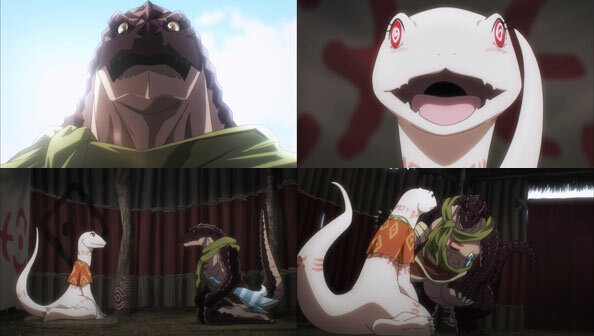 I also appreciated the very human behavior assigned to these anthropomorphic lizards; I never forgot they weren’t human but I could still easily sympathize and empathize with both of them, and there was a good portion of casual humor mixed in to keep the proceedings from getting too stodgy. Crusch (wearing a bush to protect her pale skin from the sun) accompanies Zaryusu to the next tribe, the war-loving Dragon Tusk. Their leader, Zenberu, knows why they’re there, but Zaryusu will have to prove he is strong before they ally themselves with Green Claw and Red Eye. Meanwhile, Cocytus prepares for battle, I’m assuming it will be against the Lizardmen tribes (I may well end up being wrong, of course). 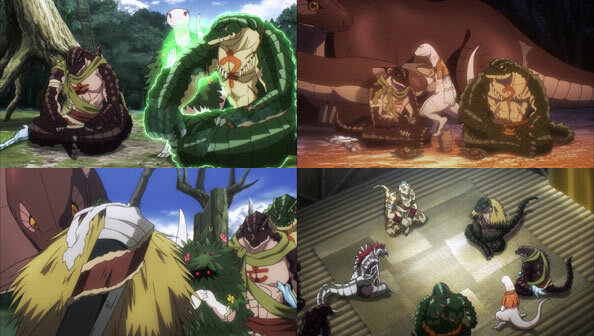 If true, the show puts us in an interesting position of rooting for the underdogs and caring about their plight, all while feeling a kind of kinship to Momonga and his cohorts. 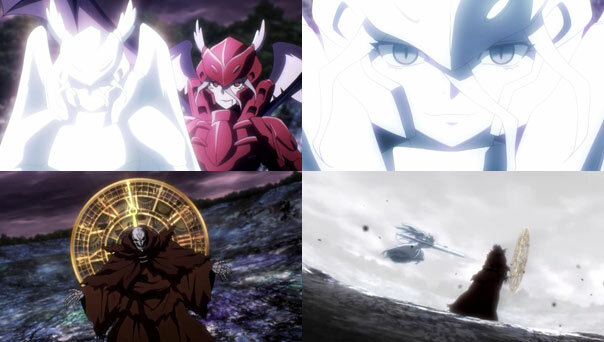 The lines of hero and villain are blurred, despite the fact one side is fighting for survival, while Cocytus merely seeks to distinguish himself in glorious battle. I’m eager to see where this is all headed. 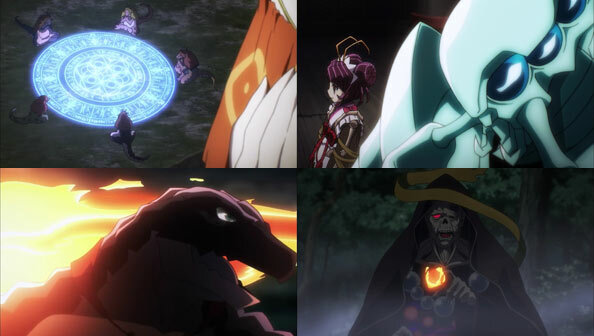 In a battle so epic it needed two parts, Momonga—sorry, Ains Ooal Gown—turns the tables for good. 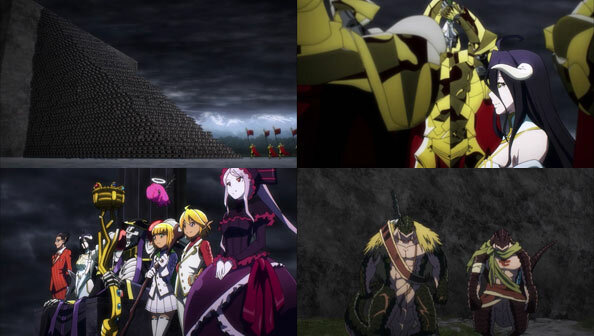 Having told Shalltear that everything has gone according to plan, he transforms into “Perfect Warrior”, the armor of Lord Touch Me, a former playmate. 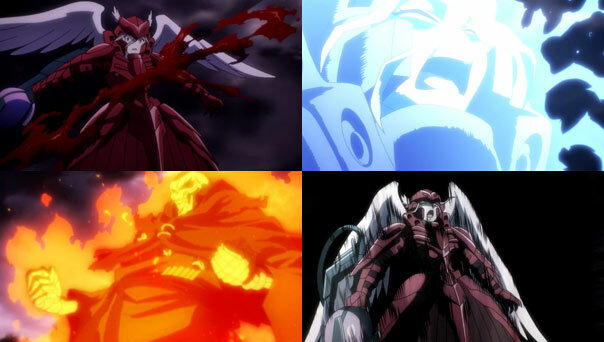 He then proceeds to summon superweapon after superweapon, so fast and unpredictably is the onslaught that Shalltear must abandon defense altogether and focus on offense, losing an arm in the process. But Shalltear wasted all her skills and most of her MP in the first half of the battle, when she thought the two participants were a lot more evenly matched. 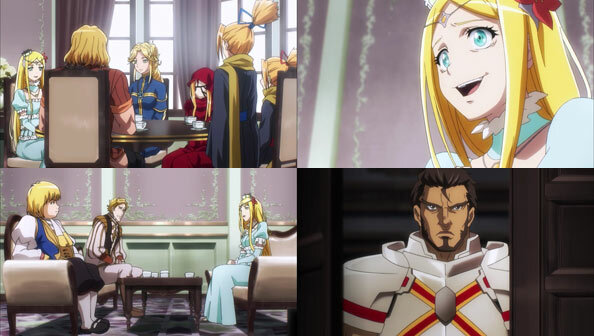 Turns out, Ains was simply lying to her, as well as failing to correct her incorrect assumptions about his weaknesses. The only weaknesses Ains had against Shalltear were dealt with in that first half, which is why he thanks her so profusely before Part Two begins. 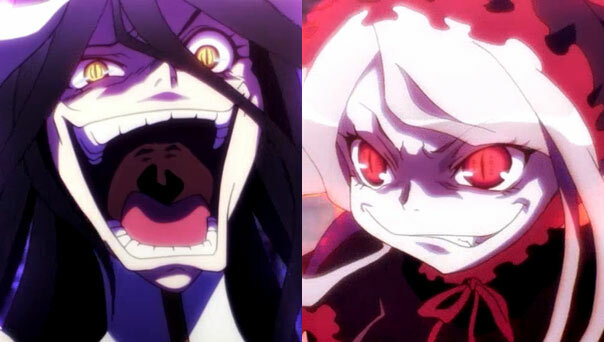 Once a timer goes off, Ains dispenses altogether with the fiction that Shalltear had the slightest chance against him and casts “Fallen Down.” As she utterly disintegrates in the light of her overlord’s power, a smile marks Shalltear’s face. He was every bit as great as she thought, and then some. Of course she couldn’t win against him. The same reason Ains had all those cool weapons is the same reason he’s able to ultimately resurrect Shalltear, albeit, unexpectedly, without her ample bosom (something she laments once she notices). That reason is cold hard cash. I’ve played my fair share of RPGs long after the main quest is complete and amassed fortunes so large I could buy everything there was to buy, which is what Ains does. And while it costs a cool 500 million to resurrect Shalltear, it isn’t as if there was anything else for him to buy. It’s all too common for villains to simply disappear into oblivion, cursing the name of the hero who defeated them. 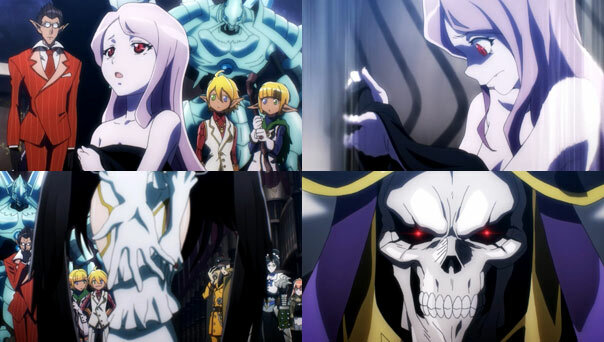 OverLord is different. 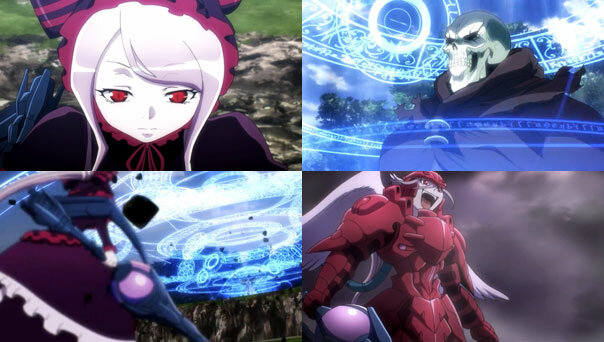 Not only is Ains not a hero but an antihero, but Shalltear isn’t a villain either; she was under mind control, which we learn was only partial, but it still did the trick in terms of having her rebel against Ains. And she comes right back, mostly the same as she was, and certainly just as in love with the adorable Ainsy-Winesy. 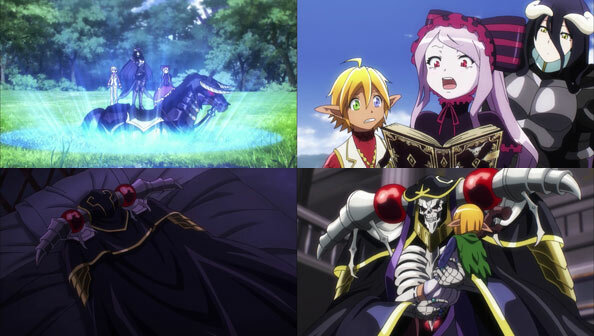 With Shalltear returned to the fold and Nazarick back at full strength, Ains gets back to work, learning all there is to be learned about this new world he finds himself in. 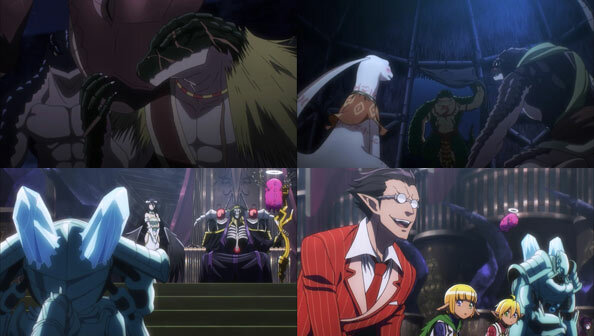 He’s awarded Orichalcum Plate, and plots to fortify Nazarick and discover the entities who tried to steal Shalltear’s Mind—we learn they’re from the Slane Theocracy, and they’re not done yet. We also learn that Brain Unglaus is still alive, as Stronoff finds him in an alley. 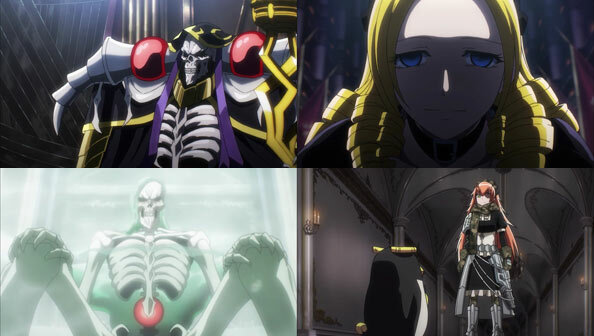 There’s no official indication at the end of this extended epilogue that there will be a second season OverLord, but I wouldn’t be surprised if there was, whether it’s in Winter or next Spring or Summer. There’s certainly plenty of material left to explore, lots of awesome one-sided battles to be fought (and perhaps some not so one-sided), and, of course, the central mystery of What Exactly Happened to the human MMORPG player inside Lord Ains. Though, at the same time, I’m kind of glad weren’t spoon-fed all the answers. 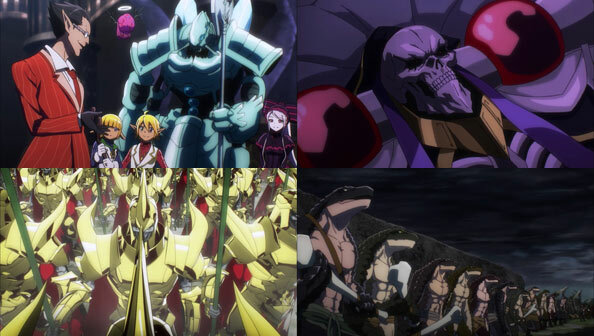 As it did so marvelously with the Clementine fight (which was nowhere near as technically challenging as this one), OverLord once again delivers with an extremely fun and satisfying payoff to all of the buildup surrounding Ains’ duel with Shalltear. The battle that took up most of this episode’s running time got my adrenaline pumping and didn’t let up, right up to the delicious ending. 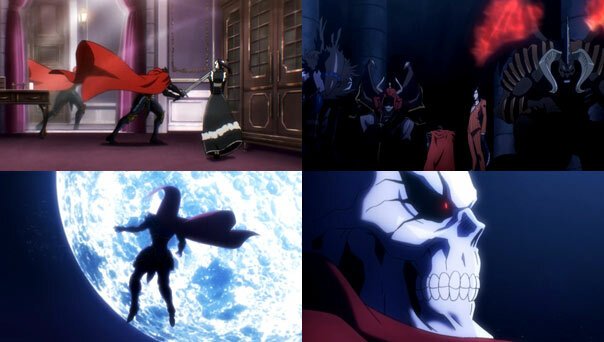 And yet it still gave us some time to check in on Ains’ guardians back at Nazarick. 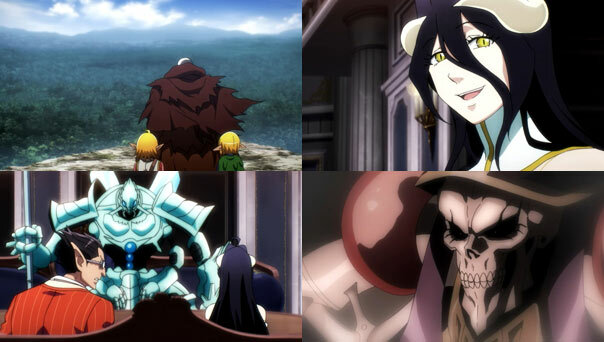 Albedo admits she let Ains go based on emotion rather than logic—a decision she likely wouldn’t have made had Ains not altered her personality to love him deeply. Demiurge, who he didn’t alter, thinks they’re being derelict in their duty to protect the one remaining supreme being by fighting in his place, but Cocytus considers it blasphemy that Demiurge would question Lord Ains’ orders or question his ability to win. The bottom line: No one is going to interfere in this fight. So, like us, they sit back and watch. And let me tell you: they’re treated to quite a show. That’s a lot of buffs, but it’s exactly what one expects of such a high-level fight. And while there’s some fun to be had in having your way with lesser enemies, squaring off against an opponent that will actually put up a fight—an optional super-boss, for instance— is one of the unique joys of RPG play. Watching Ain buff himself took me back to my own preparation for Yiazmat, the strongest foe in FFXII who has 50,112,254 HP in fifty separate million-HP bars. That level of preparation amplifies the sense of occasion, and Ains’ internal monologue establishes that even he doesn’t know exactly how this is going to go down. 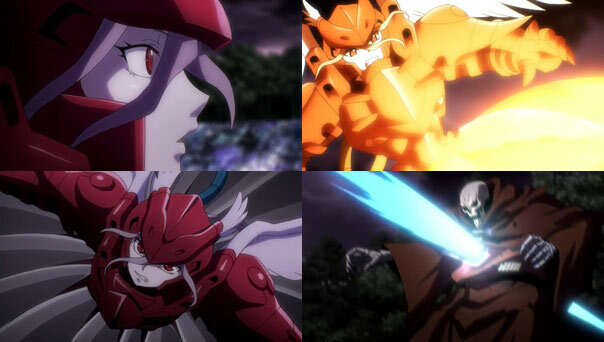 Then the fight begins, and a red battle armor-donning Shalltear cuts loose, matching Ains blow for blow. He surprises her with a few traps and attacks (and bluffs about more, knowing he must preserve his MP), but she has a few skills he’s not aware of, which he’s never witnessed her using but which she assures him her creator Peroroncino built into her. Most intriguing of all, there are moments when Shalltear realizes she has no idea why she’s even fighting her former master, but then whatever parameters were overwritten to make her rebel (or which activated after a timer went off) kick in, and she presses her attack. Reality, Lightning, Fire, Dark, Holy; elemental and non-elemental magic flies in both directions, with moves and counter-moves coming as quickly as the two combatants can call out the enchantments. Indeed, the one thing I think the battle could have benefitted from was more of an enchantment “shorthand”. Sure, it’s impressive that all Ains and Shally have to do to cast ridiculously powerful spells is say the name of that spell, but the lengthy English spell names are a double-edged sword, giving the spells weight but also slowing the casting pace. But who cares about long spell names, when we’re treated to Lord Ains conjures an effing Sharknado. (He calls it a “Shark Cyclone”, but still, pretty sweet). 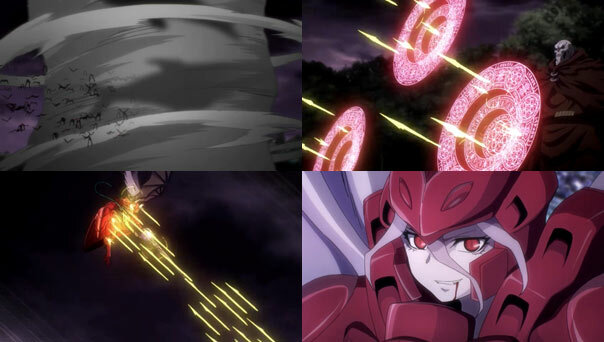 I also enjoyed the seemingly mono-directional stream of light-spears that suddenly change direction and hit Shalltear, surprising both her and us. The two just keep pulling out of their bags of tricks. 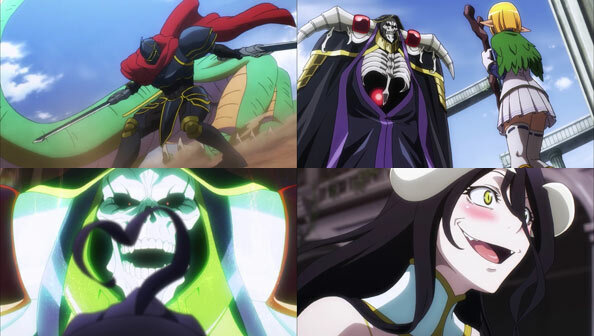 But Ains is slowly draining his MP, and Shalltear knows it. Hoping to break the stalemate, she summons her trump card (but probably not her only one), an ethereal doppelganger, Einherjar, as well as her “household” of lesser beasts. Ein lunges at Ains while Shalltear kills her own beasts in order to heal herself. 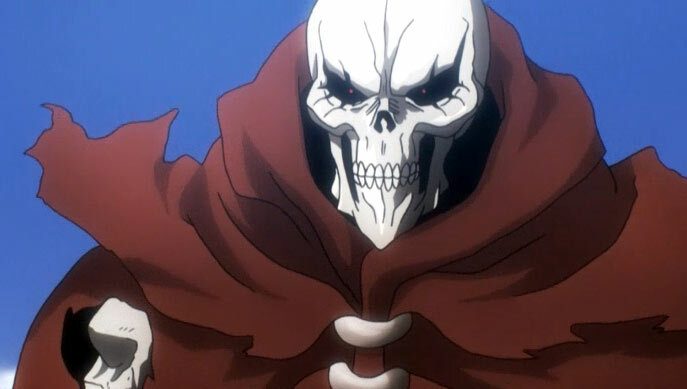 But Ains is ready, activating the skill “The Goal of All Life is Death”; a giant clock counts down, and when the hands reach twelve, both Einherjar and the household disappear, leaving Ains and Shalltear alone again in the midst of a sandy desert where the forest glade once stood. Their surroundings thus drastically transformed, the two combatants assess their present state. Both are nearly out of MP, and Shalltear is almost out of skills, but she has all of her HP, and she believes the battle is all but wrapped up. But it would seem Ains was coy even in his internal thoughts, as he expresses to Shally how grateful he is she went all out and fought him with everything she had to this point, believing draining his MP would be the key to defeating him. But that’s not the case: by not fighting him cautiously, she allowed him to arrange an even larger plan beyond the battle plan executed thus far. And next week, it will be time to show her just how badly she miscalculated. I can’t wait. Without being too direct about it, this second outing confirms that OverLord means to ask the question, “If a game were about to end and you were the last one logged in, would the NPCs make you their god?” It also answers that question with a fairly unequivocal “yes”, although those two floor guardians not present and the army at the end of the episode may be cause for concern. But not that much concern, as the people he does have on his side pledge to gladly “perish as his shield” if need be. Their skills are apparent and their loyalty appears unswerving. Momonga is someone different to each of them—beautiful, strong, kind, merciful—the recurring theme is that of ebullient praise in every possible aspect of ol’ Skullface, which seems to trigger his insecurities: what did he do to deserve all this? Well, it would seem he deserves it because he was the last human player left. If you’re an NPC of the game, the human players are supreme beings, and without them, you don’t exist. So it’s a big deal that he stayed, even if he didn’t even mean to be the last one there. 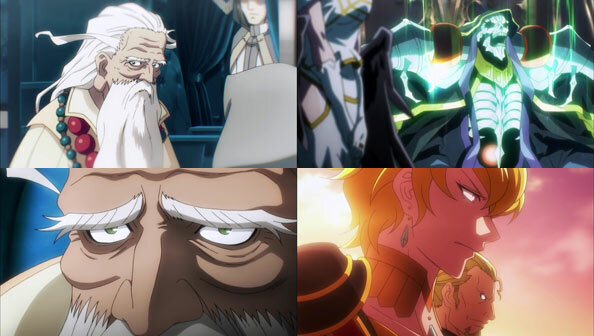 It would seem that in his careless state near the time he believed the Yggdrasil servers would shut down, Momonga’s seemingly innocuous decision to make Albedo fall in love with him caused an unintended imbalance in the dynamic of his “court” of guardians. 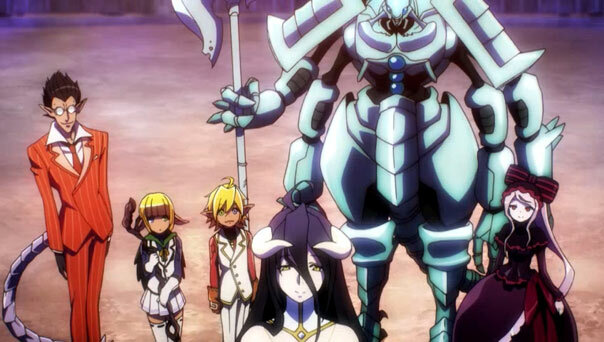 To whit: a character he didn’t modify already has romantic feelings for him, making Albedo a threat. The two smitten ladies bicker at length until deciding Momonga should have at least two wives—the two of them—making it just a matter of who’s the first wife. 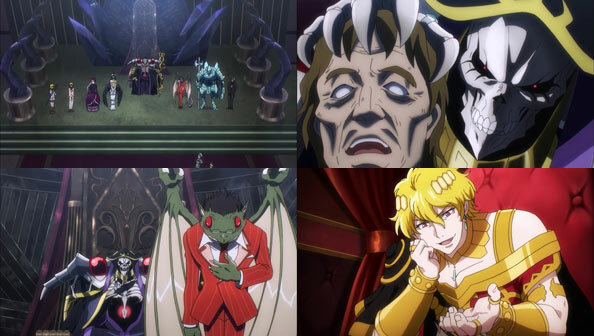 The other guardians seem to rally around Demiurge’s idea of Momonga producing an heir, so that the NPCs would have someone to follow should he leave or die. 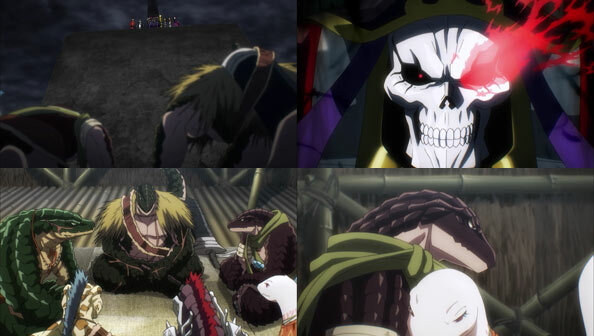 Meanwhile, after issuing general orders to conceal the suddenly exposed Tomb of Nazarick, Momonga continues to test the limits (or lack thereof) of his powers and survey what has apparently become his kingdom by default. Looking at the bright starry sky and glowing full moon, he is filled with a desire to possess everything his beady red eyes see, a goal his guardians can certainly set their watches to. Keeping this ridiculous-looking character grounded is the fact that beneath his scary and imposing facade, there’s a guy inside with no friends or family in the real world, and his frequent little jumps of fear and surprise really humanize him. 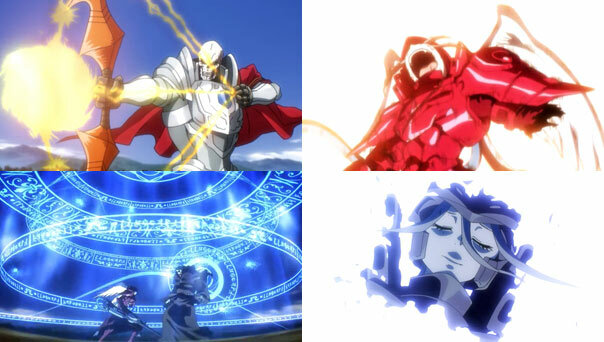 Hino Satoshi’s multifaceted performance really makes up for the lack of facial expressions. Plus Momonga tends to slump, decreasing his sinister aura somewhat. 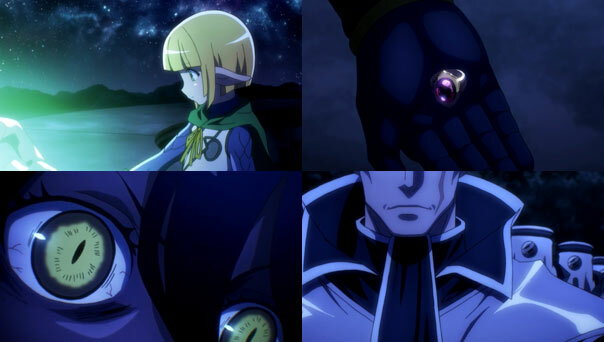 To that end, Momonga starts to make it easier for his guardians to move around, issuing Ainz Ooal Gown teleportation rings like the one he wears. 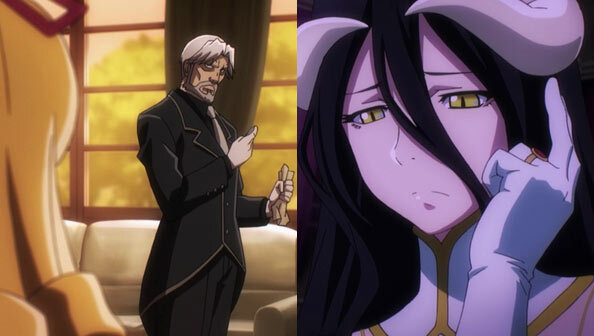 He may have made a slight slip-up in awarding the first one to Mare (who is a boy btw), because for a moment Albedo seems slighted; but she seems appeased when she gets hers. Meanwhile, as the work to hide Nazarick continues, a stern-looking general orders the destruction of another village. Are these more NPCs given sentience like Momonga’s guardians, only not loyal to him? It looks like the honeymoon may be over, but the true threat level of these guys, if any, remains to be seen. 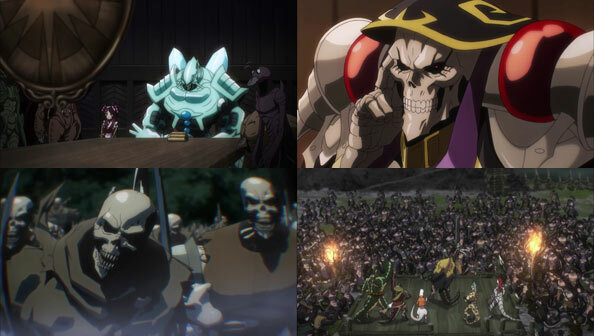 Maybe they’ll be pushovers, or swear fealty in the fact of Ainz Ooal Gown’s awesome power.